Here comes a new challenger! The Street Fighter V Rashid SH Figuarts Action Figure joins the SH Figuarts line in a spectacular one-two punch! Utilizing the neo fighting body the figure is designed from the ground up for portraying battling characters. 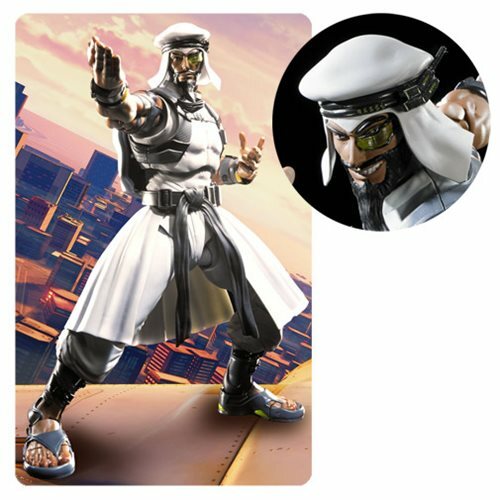 The Street Fighter V Rashid SH Figuarts Action Figure includes 2 optional facial expressions, 2 pairs of optional hands (L/R), an Eagle Spike effect, and a background sheet. Measures about 5 9/10-inches tall. Ages 15 and up.